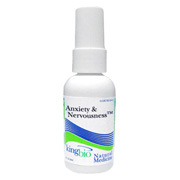 For relief of minor mood swings, fear, anxiety, nervousness, restlessness, stage fright, upset & tightness in stomach. Relieves over sensitivity to light, sound, touch, confusion, excitement, and overwork, worry. Quiets the nervous system. Aconitum Napellus • Alfalfa • Argentum Nitricum • Arsenicum Album • Aurum Metallicum • Avena Sativa • Baryta Carbonica • Calcarea Phosphorica • Chamomilla • Gelsemium Sempervirens • Glonoinum • Humulus Lupulus • Ignatia Amara • Kali Arsenicosum • Kali Phosphoricum • Muriaticum Acidum • Natrum Phosphoricum • Passiflora Incarnata • Phosphorus • Staphysagria • Stramonium Each ingredient is in equal volumes of 10x, 30x, and LM1 potencies in a pure water base. This is a great formula for people who have a tendency to be uptight, nervous, or a type A personality. This could relieve the aggravating factor behind most any condition. Anxiety & Nervousness - is shipped in a discrete, unmarked package. Orders are processed immediately and usually take about 3 to 5 working days to be received. We do ask that you try it for 2 to 3 weeks to feel the full effects. Any information received is used only for order processing and shipping purposes. Your information, such as e-mail address, will never be disclosed to a third party.